If you are worried that the heat from the chipotles will be too much for some members of the family you can reduce the amount in the recipe. Or, make a few of the burgers with a smaller amount of the sauce, and spike up the rest of the ground beef with more heat for those who like the burgers with a kick. For even more heat, stir a little of the chipotles in adobo into some mayo with a squeeze of lemon or lime juice, and you have a creamy spicy burger topping (also great on sandwiches). In a large bowl combine the beef, pureed chipotles in adobo, salt and onion. Hands are best for this. Form the mixture into 4 patties, and use your thumbs to make slight indents in the center of each burger, which will cause them to end up flat when they cook. Preheat the grill to medium high. Grill the burgers for 4 to 5 minutes on each side, until they are done to your liking. 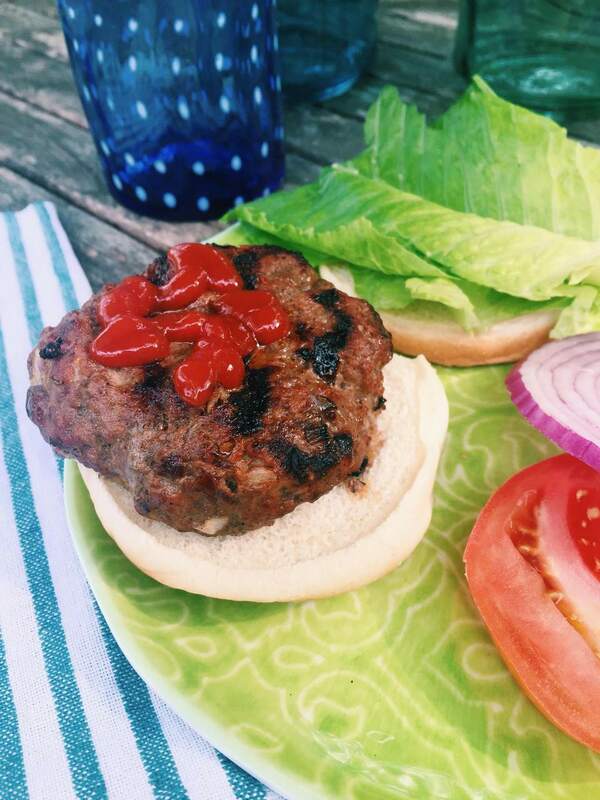 Serve on the buns (toasted if you wish) with lettuce, tomatoes, onions or anything you like! Note: To make pureed chipotles in adobo, simply buy a can of chipotles in adobo sauce, dump the whole thing into a food processor and purée. The sauce will keep in a tightly covered container in the fridge for about 2 months, at least. For your next get together, check out this 4th of July Family Friendly Menu and Entertaining Basics!